A few years back when I was heating massage stones in a basin of boiling water every night to help keep me warm through a heatless winter (I could not tolerate the gas-powered heating system in my home, nor could I tolerate any portable heater I tried…), some boiling water splashed out on my foot. A huge blister, infection, and nights of swathing it in raw Manuka honey later, I decided to prepare ahead for my next burn. I found an anecdotal herbal burn remedy online, using comfrey root. Comfrey is a cooling herb, and it works by drawing out heat. Then the allantoin in it starts regenerating damaged cells. After reading several stories online of how comfrey poultices healed burns, I immediately purchased comfrey root and got to work. I followed the directions to a T (breaking the blender in the process – use a Vitamix if you don’t want to risk ruining your motor!) 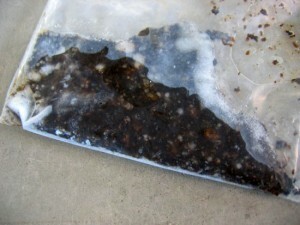 and made a comfrey burn relief poultice to be frozen for future use in a used Tropicana cardboard orange juice canister. There was some extra which I threw into a plastic sandwich bag. Sadly, somehow the bulk of the frozen poultice got left behind when I began my nomadic search across the country to find safer housing. But I saved the frozen sandwich bag and had it with me last week when hot oil splattered across my wrist and palm. Hot, burning oil. Really hot. Within seconds, it was searing my skin, a really deep, deep burning. I immediately put my hand under cold water, then ran to get my frozen poultice. It was too cold to keep on the burn constantly, but within a few minutes it defrosted enough, and I was able to cover it with a gauze. I had no first aid tape but luckily the herb mixture stuck to my hand, and to the gauze. I was able to sleep with the gauze firmly in place all night. Here’s the thing: the poultice completely removed all pain. I’ll say it again: I had no pain once the poultice was in place. Now, granted, the oil splatter was just a few drops and covered a very small section of skin. I can’t speak for larger burns. But my comfrey burn relief poultice lived up to its name, and it had been frozen for over three years! That’s impressive, if you ask me. *Note: Because comfrey contains a significant amount of pyrrolizidine alkaloids, which has been linked to liver damage, comfrey is recommended for external use only. Avoid using on broken skin. Pregnant and nursing mothers are also advised against using comfrey. It’s important to note that in order to avoid further tissue damage, burns should be attended to immediately – don’t wait! Ideally, cold running water, ice packs, and natural remedies should always be close at hand. Even minor burns can cause some to go into shock, so rest and awareness are key. Serious burns should always be treated as an emergency and seen by a physician – you can apply homemade natural remedies on the way to the doctor’s office or emergency room. Note: I used the root but I found plenty of recipes online that only used the leaves, or a combination of leaves and roots. Clean your harvested root and leaves thoroughly with water, then chop coarsely. Put in blender with enough water to cover half the plant material; add more as needed. Blend well to the consistency of a thick soup. Pour the blended mixture into an empty cardboard juice concentrate container, seal in a freezer bag and place it in the freezer. To use, cut off a small portion and return the rest to the freezer. 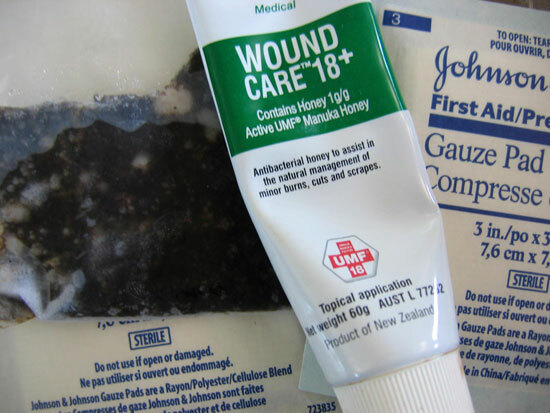 The other item I make sure I have on hand in case of burns is raw Manuka honey from New Zealand. Those with higher levels of Unique Manuka Factor (UMF), a very beneficial antibacterial property found in some strains of manuka honey but not all, are said to have specific healing properties that help in burn recovery. Not only is it antibacterial, but it nourishes and promotes tissue regrowth so scarring is minimal. Try to get an organic version if you can, with a UMF of 15-18+. Use with care, the higher UMFs can also be irritating. After a trauma to the body like a burn, its also a good idea to make sure you’re eating a nutrient-dense diet to help support your self-healing capabilities. An anti-trauma homeopathic remedy like Arnica montana plus any one of the following might also be helpful: Cantharis (for extreme burning pain), Causticum (for intense pain and forming blisters), Hepar sulphuris calcareum (for very sensitive and painful burns in people who are prone to infection), Hypericum (for intense pain and extremely sensitive nerves), Phosphorus (for electrical burns), or Urtica urens (for mild burns with redness and stinging pain). With the right tools on hand and attention to diet, you can avoid the pain, infection, and unsightly scarring that can come from burns. As with any ideas presented in my High Desert Healing column, please consult with your physician. I have only tested the above on smaller burns. With any burn (and especially larger and more severe burns), you should definitely have a qualified health care practitioner check it out immediately.